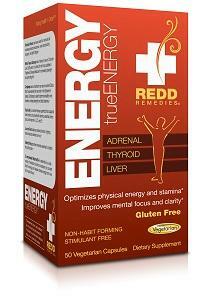 The foundation of trueENERGY is powerful adaptogen herbs, Rhodiola rosea and White Panax ginseng. These herbs bring balance to the body, allowing for optimal physical and mental energy. Rhodiola Rosea - has been used for centuries to increase physical endurance, work productivity, longevity, and fight fatigue. White Panax Ginseng - has a history of use in China for over 2,000 years. It is prized for its tonic qualities in Traditional Chinese Medicine for increasing strength and promoting life. Cordyceps - was a mushroom so rare in ancient China that it was reserved for use only in the Emperor’s palace. Cordyceps is used to promote healthy liver function, increase strength and build stamina. Royal Jelly - is a nutrient-dense superfood that supports liver function and provides B vitamins, essential amino acids, and vitamins A, C, D, and E.
Licorice Root - balances adrenal function, fighting stress induced adrenal burn-out. Atlantic Kelp provides minerals essential to healthy thyroid function. Co-enzymated Vitamin B-6 - is essential in a wide variety of metabolic functions necessary to convert food to energy and release stored energy from liver and muscle tissue. 2 capsules daily - preferably between meals. For best results, use with trueENERGY aromatherapy inhaler. Just started taking this on Tuesday, Nov. 10th and I can already feel the difference!